A short time back my wife told me about an email she got at work and how there was going to be a push to collect care packages for soldiers in Iraq and Afghanistan. 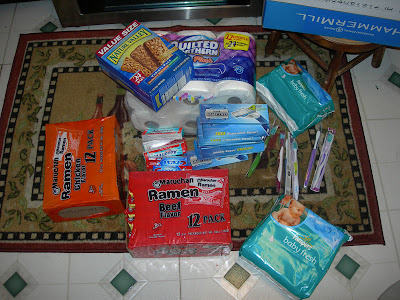 She felt the compulsion to put together a care package drive and I jump in with both feet to help. We got together friends and family as well as some members of a forum board I frequent and put together a pretty sweet package if I may say so myself? When your slugging through the desert who wouldn’t want 3000 packets of Texas Pete, sunflower seeds and a football? If you ever get a chance to take part in one of these care package drives I suggest highly you do so. 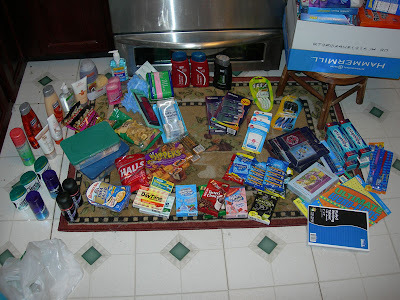 You don’t even have to really do it on a large scale, there are tons of resources available to send care packages. Even the United States post office has special boxes as low rates to send over stuff (albeit small boxes). If you’d like more information on how you can send letters, and care packages overseas with very little effort check out http://www.anysoldier.com (http://www.anysoldier.com/HowToSend.cfm). Hi. Just wanted to drop you a quick line and say thank you from a lot of people. Your care packages made it to our FOB (forward operating base). Just a little outpost somewhere in western Iraq. We serve a great deal of Marines, Sailors, Soldiers and civilians here and the fact the your packages came to a BAS (Battalion Aid Station), the HM’s(no idea) here will be sure to share the wealth. Personally I think you were WAY too generous but you really will make a lot of people happy with a little taste of home. We all have some wacky histories in the military, mine is no different but it is an honor to serve again. Some of us out here are reservists and some active duty, so we have the best of both worlds. I couldn’t let the day pass away without saying THANK YOU for your time, the guys’ time, and for EVERYTHING you sent. It means a lot to us all to have someone back home besides our families who support us. It means more than you will ever know. I hope you have a great holiday season and be rest assured that we will share your items with everyone who walks in our door. By the way, if you want to make your local wal-mart cashier feel like total crap….. go to there, grab a basket and go clean out their travel goods (mini shampoos, shaving cream etc). Go to check out and dump it all onto the belt. Give her/him a few seconds to fester. Then tell them what it’s for. Sit back and be amazed how fast their attitude changes, might even make their day.